I am Antonio Margarito’s right orbital bone (or bones, there’s 7 of us, if you want to be specific), and I am pulverized. Maybe I should say I am what’s left of his orbital bone. I think the Pacman saw the fear that I contained, and wanted to knock it out of me. Round after round I was assaulted. The eyes which I contain have never seen fists moving so fast, and maybe that’s the problem; those eyes were basically swollen shut by the later rounds and covered in blood, so any shot those eyes had was out the window. I’m here to support you Antonio, primarily your eyes (and also the lacrimal glands, so it has been hard for you to cry yourself to sleep), but if you subject me to this punishment again I’m probably going to give up. I now have to wait around 6-8 weeks to heal and then we can see if all those muscles that control your eye even work still. What worries me most is the only other guy that has my back is the brain. Once you get through me, he’s the only backup I have. I guess if the doctors find my injuries bad enough they can reconstruct me with some swine bones, or your maxillary bone, but I don’t want you to have an even more glass jaw. For the time being it’s a waiting game to see if I’ll ever be in the ring again, but I may not be too disappointed if the last time I see the ring (through blood and swollen lids) was November 14, 2010. 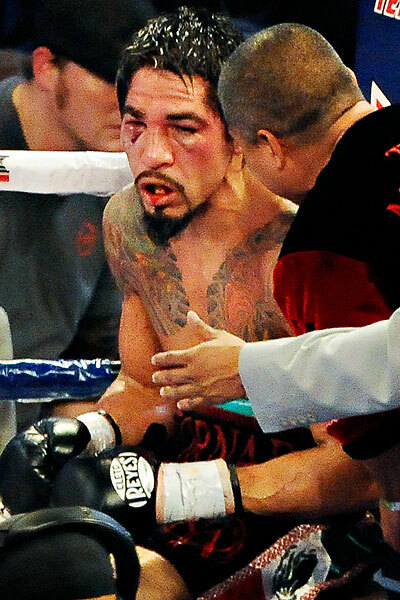 I am Antonio Margarito’s right orbital bone and I am pulverized.